TILTED AXES: Music for Electric Guitars was created in 2011 for Make Music New York’s inaugural Winter Solstice event. The guitarists perform original music by Patrick Grant through powerful mini-amps strapped to their sides while traveling the city streets. Since its inception, TILTED AXES has had incarnations in New York, Detroit, Germany, Brazil, and other locations. This is the only ensemble of its kind and Grant is its inventor. Not one of the near quarter million people who have encountered TILTED AXES on three continents could say they had the same experience. The group moves and comes and goes. While many wild audio recordings and street videos of the project exist, producing studio recordings of the Tilted music would attract the wider public. The purpose of this album is threefold: 1) to expose the music to a new audience, 2) to raise awareness of the project and its uniqueness, 3) to generate future work, to interest other cities and communities to have a TILTED AXES event and music created just for them. TILTED AXES works best when it’s part of something bigger than itself such as celebrating a key date for a city (for seasonal openings), to be a moving billboard promoting festivals of all kinds, attracting the public to a center of activity. Besides the street, the group works equally well on stage, or roaming through museums, but it’s best when it surprises people in unusual locations. Grant describes the music as Post-Progressive Rock, an intentionally vague genre that means to contain the various styles and performing techniques within the repertoire. These include elements of Prog Rock, Contemporary Classical, World Music, Blues, Film Music, and incorporating the music of the host city. All in all, it boils down to theme and variations. Astute listeners will hear recurring themes and motifs that run throughout the 17-track 74-minute album. Each piece can stand on its own but the album can be heard as one continuous narrative. More so, tracks 7-13 could serve as a mini-suite, a set within the set, if one wanted to listen to it that way. Appearing on the album are NYC Tilt Core regulars as well as cameo appearances by guitar luminaries associated with Robert Fripp, Edgar Winter, Alice Cooper, Joe Perry, Dr. Nerve, The Blackfires, and more. Grant’s professional experience includes work with John Cage, Philip Glass, Billy Joel, Quincy Jones, Don Was, Balinese gamelan, and composition for the legendary Living Theater and the theatrical visionary Robert Wilson. 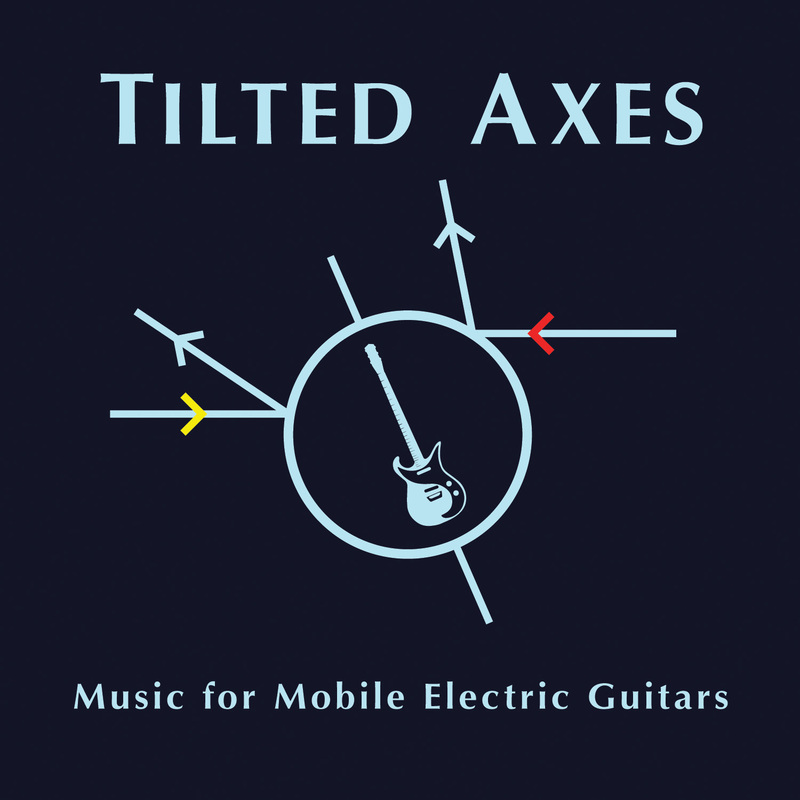 All of the compositions on TILTED AXES: Music for Mobile Electric Guitars are by Patrick Grant with two of those pieces sharing writing credits with Robert Fripp. The album is available for download on Bandcamp, iTunes, Amazon, Spotify, and all the usual suspects. Those wishing physical copies will be able to get those on CDBaby. 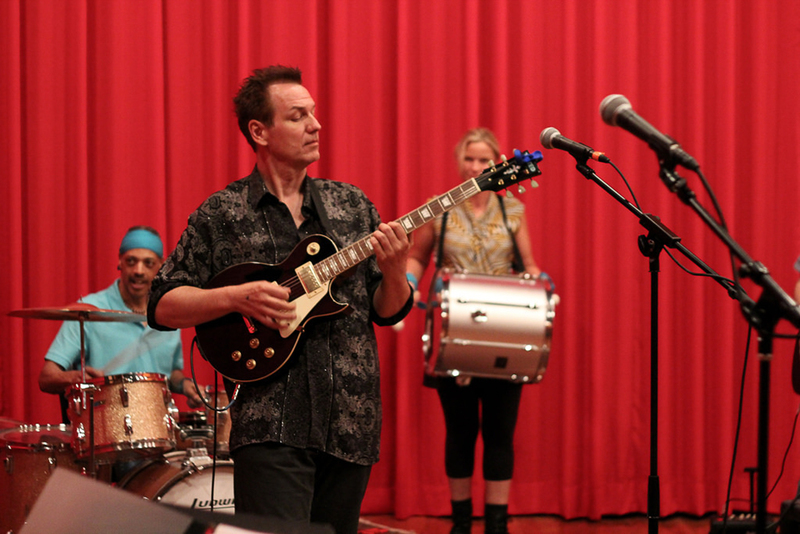 Patrick Grant is a composer/performer living in New York City and creates music for a wide range of media. A native of Detroit, MI, he moved to NYC in the mid-80s where he studied at the Juilliard School, worked on the production team for composer John Cage, and produced his first recordings at the studios of Philip Glass. He spearheaded the compositional element of an international project for the Millennium which had him working with Billy Joel and Quincy Jones. Interest in world music brought him to Bali three times to study the gamelan which manifested itself in his work through the use of alternative tunings, ensembles with multiple keyboards, and in his work with Robert Fripp & The Orchestra of Crafty Guitarists. He is host of the internationally acclaimed podcast Strings and Things. Grant is a recipient of the 2012-13 Con Edison Musicians’ Residency: Composition Program at the Turtle Bay Music School administered by Exploring the Metropolis. In 2012 and 2013 he received ASCAP Plus Awards for continued musical excellence. Recently, he performed as music producer and co-arranger of NYFA Fellow Joseph Keckler’s “I am an Opera” for a month of sold-out shows at Dixon Place in NYC and beyond. He is the creator of International Strange Music Day (Aug. 24th) and the ‘electric guitar procession‘ as a genre. Recently he was granted rights from the Beatles’ publishers to create a set of variations on Strawberry Fields Forever for chamber ensemble and rock band. He has created scores for theatrical visionaries The Living Theatre and Robert Wilson, and music for installations at the Louvre and the musée du Quai Branly in Paris. His music has been applied visually through seven collaborations with the artist Kehinde Wiley, scores for feature documentaries, and music tech seminars each semester at the NYU Film School. Within the last year his music has been performed extensively by theater troupes in Brazil, appearing in the major cities and international festivals there. In 2009, with radio producer Jocelyn Gonzales, he created the MMiX Festival of Interactive Music Technology in NYC, an event co-sponsored by Ableton (LIVE), Cycling ’74 (Max/MSP), and WNYC Radio. In December 2009, he music directed the European premiere of his electronic realization of the Morton Feldman/Samuel Beckett opera “Neither” in Vienna. In 2010, Grant returned to Europe and Brazil for new works in concert, theater, and multimedia and created H2Opus: Fluid Soundscapes by Multiple Composers for Make Music New York 2010. Grant also produces content for the new music blog The MMiXdown and is a co-director of Composers Concordance Records. He has created musical scores for the Cornell Gamelan Ensemble and the Margaret Jenkins Dance Company in San Francisco (a piece called “the strangest and most ravishing dance of the year” by the SF Chronicle and nominated for Best Dance Score of 2003 by the Isadora Duncan Dance Awards). His work often involves elements found in the natural and physical sciences (Genome: The Autobiography of a Species). He has been commissioned by the CUNY Graduate Center (BIG BANG 1.0), jointly by the artist Kehinde Wiley (for soprano Shequida), Deitch Projects (Rumors of War), and The Columbus Museum of Art (Historical Black Music Rollercoaster), and the Modern Museum of Fort Worth. His works have been performed at the Bang on a Can Annual Marathon, MATA – Music at the Anthology, by Gamelan Son of Lion, The CUNY Graduate Center’s Science & the Arts series, and the Forum Freies Theater in Germany. As a presenter, Mr. Grant has produced scores of new music concerts in the alternative spaces of New York City, in art galleries, theaters, factory lofts and clubs, since 1988. He formed his own ensemble, the protean Patrick Grant Group, in 1998. He is founder and artistic director of Strange Music Inc., an organization dedicated to releasing recordings and presenting compelling new work with performances and installations in New York and around the world. He formed Peppergreen Media in 2011 as a way of broadening music’s reach into other media.